Should a K9 team that just finished a 6-14 week basic K9 handler’s course be considered ready for the street? While there are those that say yes and a few who say no, I think it completely depends on the type of K9 deployment they’re being called in to work. A new K9 handler/team should not be relied upon to work all situations and should be closely monitored when working street calls, that is until the team proves they are ready to do so on their own. Think about this, when officers graduate the academy, do they show up at their new department, receive issued equipment, a new (at least new to the rookie) Police Car and then get released into their jurisdiction to do great and wonderful things on the street? Absolutely not! A majority of departments have a lengthy and rigorous field-training program, as they should. 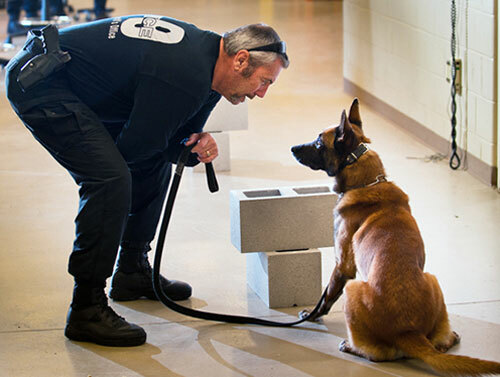 The academy doesn’t fully prepare recruits for the street, it only provides the basic foundation to build upon, similar to what a basic K9 handler’s course does for a new handler with their K9. 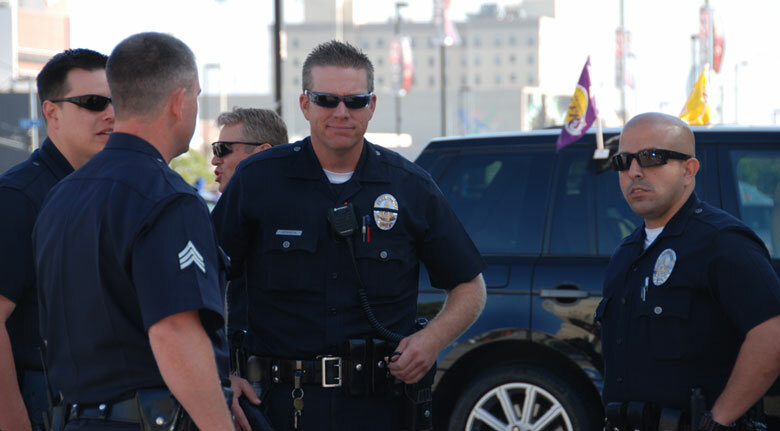 After academy graduation, the brand new Law Enforcement officers are partnered with seasoned officers, who most likely have formalized schooling in how to transition a rookie officer from the academy to the street. These officers are called Field Training Officers (FTOs). 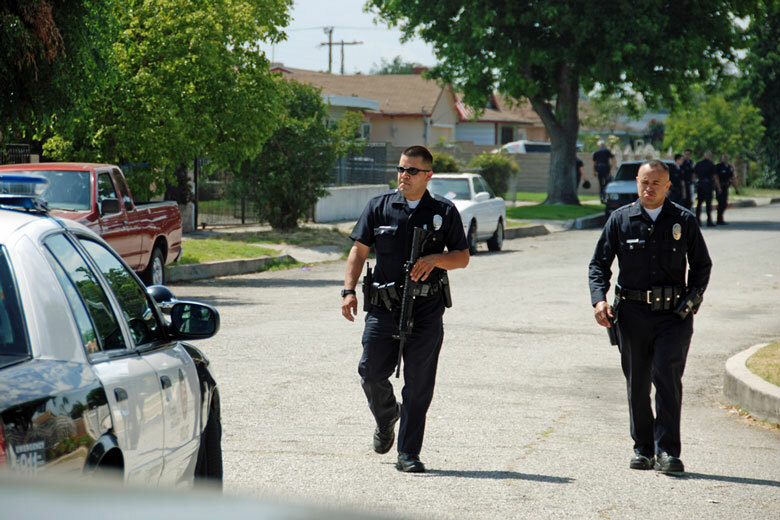 Field training covers the in’s and out’s of the real day-to-day Police work. 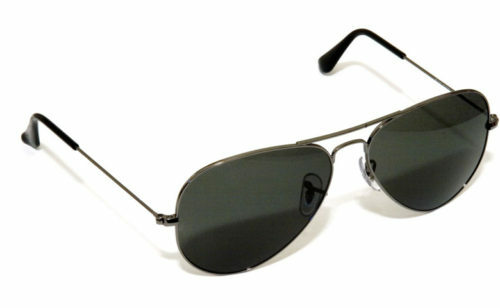 The FTO will closely monitor the rookie in dealings with the public; the good people as well as the bad. A good FTO will place the rookie in stressful situations, ensure they get into physical arrests, all while making sure officer safety is followed and professionalism, along with department policy, is understood and observed. Aside from what I’ve listed, even more lessons are taught when off the street and back at the station during the completing of case paperwork. The old adage, “If it’s not in the report, it didn’t happen,” is gone over time and time again. Reports are slaughtered with the mighty red pen and returned to the rookie to make the corrections, only to have the report returned two to three more times. The proper way to process evidence is pounded into the rookie’s head to ensure it’s fully covered. From the crime scene to the officer’s possession, it’s packaged correctly, placed into evidence, off to the lab and then into court. Some departments have their new officers work with more than one FTO and the process can last several months. During this time, the FTO’s are keeping detailed notes and reports on the new officers’ performances. These reports, as well as the recommendation of the FTO’s, can make a final determination on whether the officer will be retained by the department or released. I’ve known of several people to make it through academy, but not off FTO. Some were released and some quit after seeing what the street is actually like. It’s a different reality when dealing with real-life situations compared to an academy’s role-playing scenarios. The cold hard truth is not everyone is cut out to be a Law Enforcement Officer. If the rookie officer makes it off FTO, they’re also on a probationary period. This usually lasts a year to year and a half, while still being closely monitored. It’s all done to ensure that the new officer is properly prepared, trained, able to follow depart operating procedures and can perform at the required levels to be a Law Enforcement Officer. So Why Not K9 Officers? So, if departments are taking these lengthy and necessary steps for rookie officers, then why don’t they do the same for new K9 teams that have just graduated their training? It’s usually much shorter than the basic academy too. 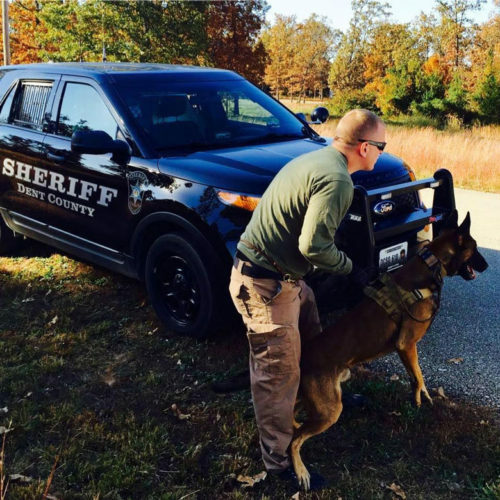 Most officers selected for K9 are required to have several years at their department. I also believe that an officer applying for the K9 Unit should be required to work with current handlers and teams of the department on their scheduled K9 training days. One departmental client of BCPK9’s does a great job with the officers wanting to get into the K9 Unit. If they’re selected and meet the departmental requirements, the officer is assigned to the K9 Unit. They work the same shift with the K9 Officers, lay tracks as well as learn how to decoy (that’s the person who gets bit in the suit) for the dogs in the unit. 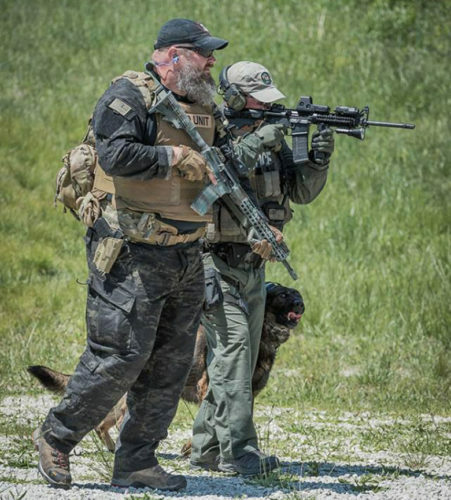 They also serve as the cover officer for the K9 teams during deployments and it’s a huge advantage for the officer to be able to work alongside current teams. After this they are still required to go through a formal interview board. During the time the officer is working with the unit, the Unit Trainer and Unit Commander can gauge on the officer’s level of commitment and performance. If the department does the process correctly, interview boards are held for the officers who wish to be K9. On the board should be the K9 unit supervisor, K9 unit trainer (if the department has one), a senior staff officer (Chief or second in command), as well as two current handlers of the K9 unit. The board should always be an odd number so a tied vote can’t happen. A physical fitness test should be administered as part of the process as well. Once the selection is made the officer is sent to K9 handler’s school. It’s one of my pet peeves and I believe there’s nothing worse in the K9 world than the officers I often refer to as the, “K9 Car and K9 T-shirt handlers.” These are the officers that only want what they view as the “perks” of being a dog handler, while applying very little to the profession. They’re never committed and do the minimum amount necessary to coast along. They always have the lowest numbers in the unit in narcotic finds and they rarely have street apprehensions. They can never be found if they’re needed for a K9 callout while they’re not at work, or even answer the call when they see the caller ID. Their dogs are usually below industry standards and they rely on the trainers to “tune” them up right before certifications. They’re happy and content to have the take-home K9 vehicle, wear the different BDU style K9 uniforms and have the cool K9 t-shirts that come with the job. I have little use for this type of handler. I believe they have no business or right to be in our community. I have little use for this type of handler. The handler’s dog and the victims of crimes these teams are relied upon to protect and serve, suffer the most. We have a duty to train as hard as we can, be a complete professional and be as ready for the next call as best we can. If a department can follow what I’ve laid out above, which is having an applicant work with the K9 Unit before actually going to school with a dog, or getting a new dog, do a complete interview board with the staff and K9 officers serving in the unit, then they can usually be culled beforehand. 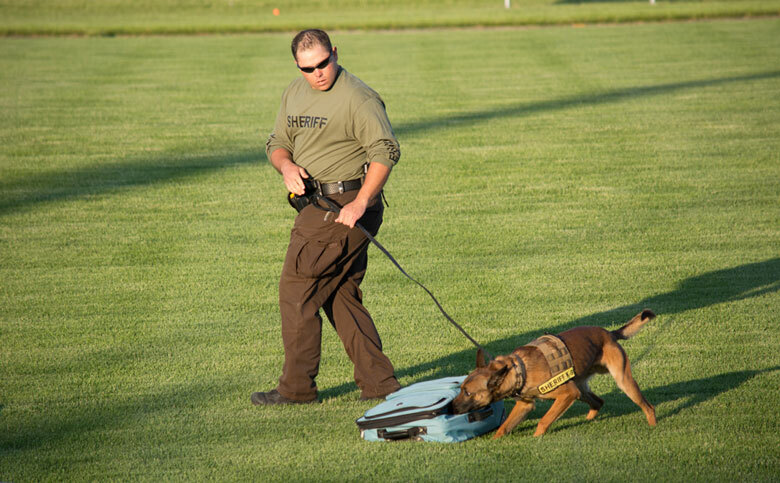 Most schools nationwide have a dual-purpose handler’s (patrol and detection) class length of 6 to 14 weeks. Every school differs in how teams are trained. Most have a dog that’s started, imprinted on the odors they’ll be trained to detect and has the foundation for patrol work. This allows the new handler to participate in the finishing of the dog. It also helps to give the handler a bit of knowledge to how their new dog is trained. This can help in future training if problems arise in the team’s work. There are times when a new handler gets a seasoned dog because of a handler switch within the department. I believe that vendors and trainers should still revert back to the basics with the new handler, even with a veteran dog. There’s nothing wrong with returning to basics with a street proven dog, especially if the handler is green. Even with my own detection dog, I still work boxes every week or two. Sessions are short and fun for the dog. We also use an active reward system that builds a very hunt-driven detection dog. If done right, they never grow tired of it and ALWAYS want more. With a seasoned dog and new handler, the box room is where we start the foundation for detection, but that’s not the topic for now (more to follow in a different article). As both a vendor, trainer and veteran handler, I’d be very cautious of the schools that claim to be able to train a team in less time than what’s been mentioned here. 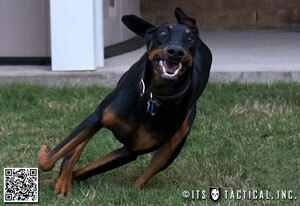 I know of vendors that offer a “fully trained” dog and a patrol/detection course of two weeks. This seems very appealing to departments, especially nowadays with the shortage of officers for many of them. I can’t stress enough, the importance that there are no shortcuts when training a new team; training days are long and hard. Proper training is a mixture of classroom work, fieldwork, written exams and mock-written K9 reports. I can’t imagine completing all parts of a handler’s course with a new team in only two weeks. There’s simply no way to do so. Most department heads are clueless as to what it actually takes to turn a green dog and a green handler into a certified Police Service Dog Team. While a two-week handler’s course on paper is appealing for the staff, the new team isn’t given full and suitable training. Once in school, the team receives (or should receive) the basic training in order to pass a national or state-accredited certification. A certification is the bare minimum a team should have to pass in order to work the street. When I began my K9 career, I remember how I thought the certifications were difficult. I always certified with the North American Police Work Dog Association (NAPWDA) as well as the Missouri Police Canine Association (MPCA). As I progressed in my career, I realized the certifications weren’t difficult at all. If a handler isn’t catching on after this amount of time, they’re probably not suited to the position. I started training to a much higher standard than the certs and never had an issue with a certification, passing each one with ease. However, in school and with the minimum amount of time that teams have, most are focused on passing only the minimum standards. In no way, shape or form is a new team, who just passed a minimum standard certification, fully prepared and ready to go out and work street K9 deployments on their own. At BCPK9, we try to do the best we can and do as much real-life scenario training with our teams as possible. The first three to four weeks are all about getting the teams working together, solidifying all areas of detection, as well covering all areas of patrol work. If a handler isn’t catching on after this amount of time, they’re probably not suited to the position. We send them back to their department, per our contract. The department will then send another handler to be trained with the dog. Another issue I see with some vendors is pushing out handlers that have no business being K9; they’re concerned only about money. I’ve seen many handlers that have no business holding a leash given dogs. Speaking of new handlers teamed with extremely high driven Malinois, one team specifically comes to mind. This handler was about 5′ 1″ in height and weighed around 125 pounds soaking wet. A well-known and used Police K9 Vendor teamed this brand new, way below average sized handler, with a 130-pound German Shepherd that had major aggression issues. I’m 6’5” and this dog could stand on his hind legs and look me in the eyes. It was absolutely insane to see them together; the handler had zero control over this dog and the dog had zero respect for the handler. This was completely unethical for the vendor to do, but they only cared about the department’s check and pushing the team through the certification at the end of the handler’s course. Getting back on track, the last week or two of training, we try to do mostly scenario-based drills. We implement the use of Ultimate Training Munitions (UTM), which we feel is as close to being able to replicate gunfights as we can. The rounds are fired from the officer’s duty weapon, after we exchange the barrel of the gun for an UTM training barrel. The rounds hurt when you’re hit. In addition to pistols, we use M-4 training rifles as well. There’s no better learning than learning through pain. The UTM rounds leave marks and also leave memories; lessons learned. Handlers also have to wear their duty gear, along with vest during the last half of our school. We truly believe and apply the thought of training exactly how you’ll have to fight. 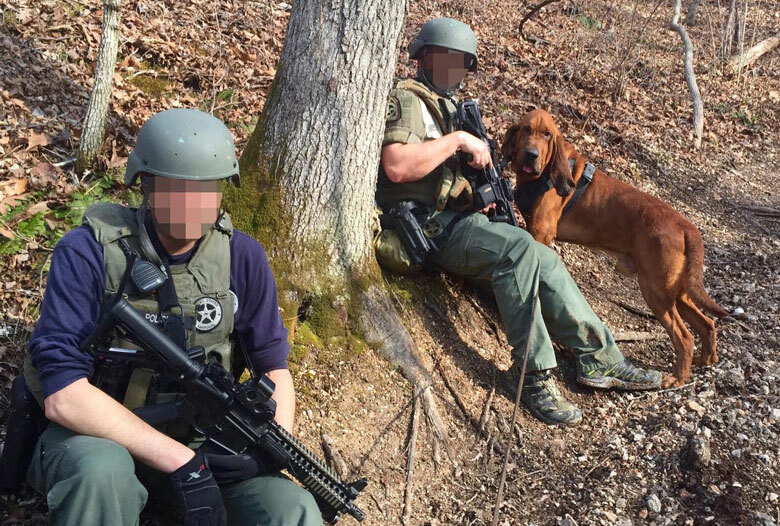 So many officers believe their dog, trained in bite work, will save them on a track if ambushed by a bad guy. 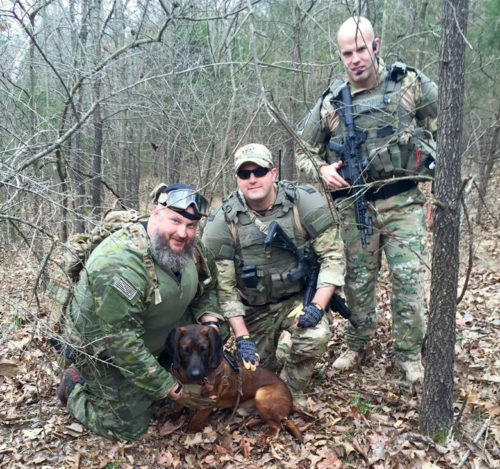 UTM training is one way we bring them to reality, setting up a track with an ambush and obliterating them after they miss their dog’s proximity alert. The handler learns quickly that if they don’t pay attention to their dog, they’ll end up dead. Not only in training, but also on the street. 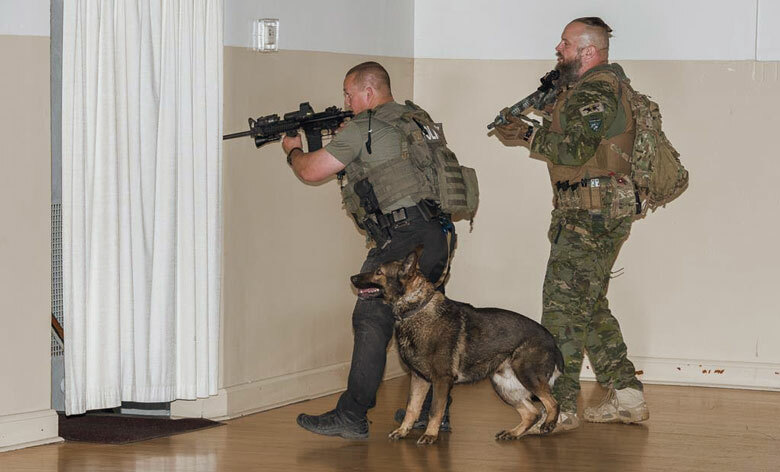 Most importantly they learn their bite dog will not save them and learn the importance of a properly trained and armed Cover Officer. Unfortunately most schools don’t train the way we do. I was speaking with a handler recently who attended a very well-known Police K9 Vendor for his basic handler’s course. 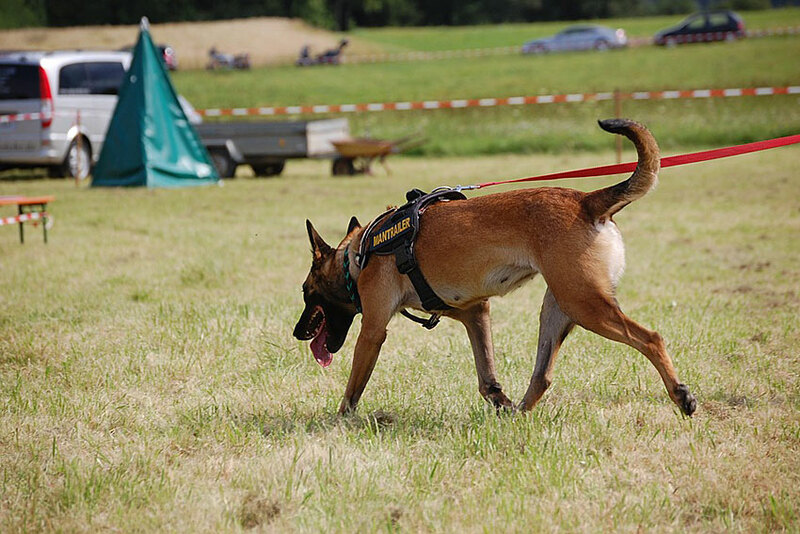 This vendor trains a large number of Police K9 Teams every year. The handler told me that with his new dog, (he was a green handler) he may have gotten 7-8 tracks during the whole 10-week school. As most dogs get closer, so does their intensity on the track. 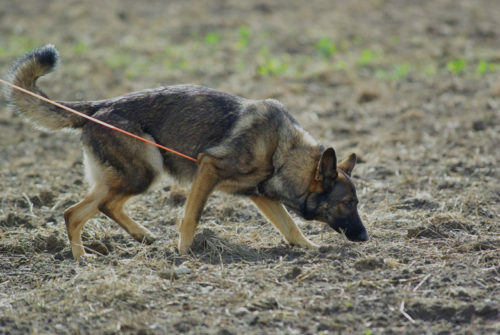 Not only did the new handler get this unbelievably low number of tracks, but either he would have to lay his own track, or another handler would lay it and then walk the track with the K9 team. They’d leave a ball at the end of the track, usually in a park with short grass. This training in no way prepares a new handler for what a real-life track on the street will be like. He received little to no training on reading the proximity alert of his dog (this is a physiological signal or signals from the dog that tell us that we’re getting close to the suspect). As most dogs get closer and so does their intensity on the track. Those that are trained to bite will start pulling harder, causing an increase in speed that could get you pulled directly into an ambush! Even in our Patrol Handler’s School, a new handler will run at least one track/trail almost every day past the first week. There will always be the trail layer at the end and the handler must learn the alert and behaviors of their dog to signal they’re closing in. It will never be in a manicured park or golf course and we run as a criminal would, through the thick woods, water and ditches. We also run along with backtracks and have scent pools left for the team. Tracks will be from vehicles, or buildings that we’ve simulated a burglary from and they’ll be as close to what it will look like on the street as possible. The tracks always begin with a scent article either left by the trail layer, or one collected by the handler of the trail layer’s last known location. Very few do this type of training even though tracking/trailing is where most K9 handlers are killed. So why don’t more schools train in this way? Because of the time and effort training requires, along with what’s usually five or six students to one trainer ratio. They’re mainly focused on one thing, the bare minimum to get the teams to pass certification. This isn’t fair to the new teams, departments, or communities they’re going to serve. We believe in a very small student to trainer ratio, never over three students to one instructor. Now, I’ve only mentioned training in the tracking/trailing discipline. For those that don’t know, the following are areas a fully-trained patrol K9 team should be trained in: Obedience, Tracking or Trailing, Building Search, Article Search (Evidence Search), Area Search and Aggression Control. 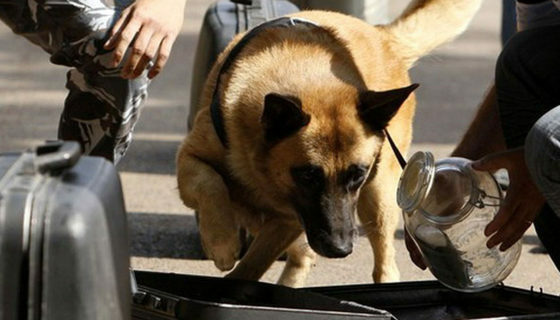 If the team also needs Narcotics or Explosive Detection, they’re trained to use their dog to locate the specific odors of their discipline in the following areas; vehicles, rooms (buildings), open area, lockers, parcels and luggage. Mass transit, such as subways, busses, airplanes & airports could be included for explosive detection teams. With all of these areas that must be trained in, do you really think that we can fully prepare a new handler to work the street in as little as six weeks with a new dog? We do the very best we can and if the handler is a “high-speed/low-drag” type individual, we can get past the minimum standards quickly and move into real world scenarios to better prepare them. We’re not always lucky enough to get these types of handlers and have to spend extra time on basic tasks to meet the minimum standard. I’ve personally attended handler’s courses at several of the larger, better known vendors in the country. There were times I would be lucky to run my dog in training twice a day, some days only once. I was a veteran handler but my dog was a very young, green dog in training for explosive detection. At two of these vendors the ratio was about 15 students to a single instructor. This is completely unacceptable. Another problem I see is smaller departments having a low number of personnel and only one or two K9 teams. 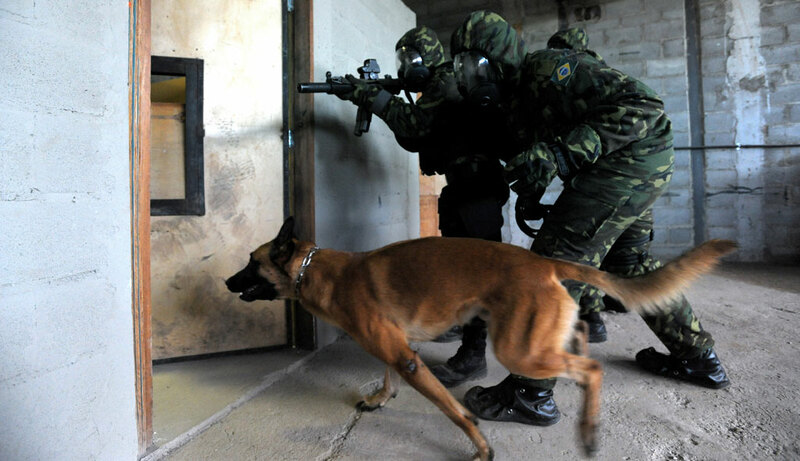 It’s likely that no one else has handled a K9 in these small departments. If it’s the department’s first dog and the handler is new, then what do they do? I try to work as close as I can with each of our handlers. After they leave school, I stay in constant contact. However, this is no way the same as getting to work with a seasoned K9 handler on the actual streets the new team will patrol. One idea for these smaller departments would be to find a nearby agency with a veteran K9 team that the new handler could ride and train with. The following is how I entered this crazy K9 world after leaving the military. Once out of the Army, I started working for my hometown Police Department. The town I worked in had a population of about 5,000, but was the only municipality in the entire county of approximately 17,000. This made the call volume for the city higher than other municipalities of similar size. The town was where everyone came for commerce and what little entertainment there was. We had 12 full-time officers, including staff and a few reserves. At the time I raised and trained Llewellyn Setters for upland game and Chesapeake Bay Retrievers for duck hunting. If I wasn’t at work, I’d be out training my dogs and season hunting with them. After a few months the Chief asked me if I’d be interested in taking over the Police Service Dog for the department. The dog hadn’t been utilized for quite a while and they didn’t even have a vehicle cage for the dog. Knowing almost nothing about Police Service Dog work, I agreed to take the dog, a seven-year-old German Shepherd named Iran. I was told I would get no formal schooling and would have to learn on my own. The dog’s previous handler, who’s still one of my best friends to this day, was going through a divorce and had very little extra time on his hands. He helped me when he could and I’m sure I made more than a couple hundred phone calls with random questions to him at all hours of the day and night. I was a sponge with very little to soak up. I’m grateful for what he did, but he’s not a trainer, nor was he able to provide me with formal schooling on being a handler. Lucky for me, K9 Iran was a very easy dog to work with and pretty much trained me. This was in early 2004 and not a lot of information was out on the Internet; I still had dial up at home and it ran as slow as any of you can remember the Internet running. I was a sponge with very little to soak up. My friend had a few books on Police Dog Training and I read them all, as well as everything else I could find about Police Dogs, detection and tracking. Anything dog related I’d read. With what little I did know, I knew I needed to be certified by someone with K9 Iran as a team. I know the following will come as a surprise, but the State of Missouri is far behind the times when it comes to Police Service Dogs working inside our state’s borders. There are no state standards; you could grab any dog off the street, toss it into a patrol car and say it’s your Police K9. Will any case you make with an untrained dog hold up in court? Probably not. It’s the idea someone could do this that really bothers me. When I started out, I knew nothing about case law, but did my own research and made a folder of what cases I might need if called to court. I knew nothing about record keeping, but bought a composition notebook and began keeping notes on all trainings and callouts (which I still have and love to read over every few months). I used other officers to hide my training aides in different areas so I could run K9 Iran and try to find them. I was a very highly motivated new K9 Officer. However, as much as I did, none of this was right or fair. It wasn’t fair to the department (other officers I’d be called upon to assist), the community we served or to me. I should have been put through a formal handler’s course with a reputable school. Unfortunately, our upper management couldn’t care less about the dog or having a K9 unit. I fought for everything I could get from the department. When I took over, there wasn’t enough money in the K9 budget to buy K9 Iran’s food for the year. When I left, the budget was four or five times what it was when I took over. I’m very proud of the fact I was able to train, almost on my own, knowing next to nothing, with K9 Iran. Two months after I was made his handler, we certified with the North American Police Working Dog Association in Narcotic Detection. It wasn’t pretty, but I passed. That day also showed me how little I really knew and set me up for the career to be the trainer I’ve become, so I’m thankful. What I just described happens more than you realize. Small departments have a dog and with very little budget, expect an officer to just take the dog and go to work. This has to stop! A state standard would help with this and I’m hoping Missouri will put one in place in the near future. Not only certification of a handler and dog, but also requirements on handlers to have proper training. We have requirements on becoming a Police Officer, as well as continuing education for the officers that they’re required to have yearly, right? Why would we not have the same for K9 Officers? All the topics I’ve mentioned above are why I believe in a mandatory K9 FTO and probationary period after completion of a handler’s school. 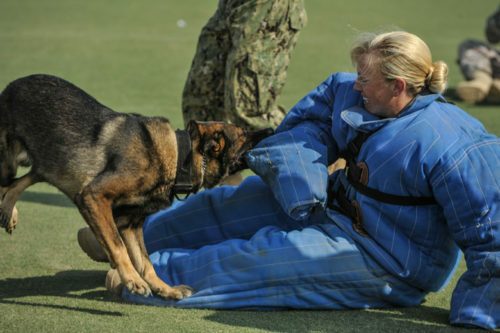 During the K9 FTO period, steps to what a rookie handler undergoes should take place. A seasoned K9 Officer should closely monitor and document all aspects of the new handler’s performance, to ensure they perform within unit policies. They should also ensure the new handler is ready to handle the high stress that comes with most patrol work K9 deployments. One of the most important requirements as a K9 Officer is record keeping. The team’s training records, as well as utilization records, must be completed in a timely manner in accordance with unit standards. When citizens need help they call the Police. When Police need help they call for the K9 Unit. Unfortunately, this almost never happens with new handlers. Why not? Departments are short on money with low manpower, so much so that most can barely let a handler attend a proper handler’s course. Still, these reasons are no excuse for not ensuring rookie handlers are fully prepared and capable to hit the street on their own. I don’t know what it will take for our industry, especially in my state, to change how they view their K9 teams’ training, especially the new teams coming out of school and being prepared to work the street. There’s a saying that many of you have heard before, “When citizens need help they call the Police. When Police need help they call for the K9 Unit.” This is so true and if the public, as well as other officers, rely upon us for help, doesn’t it make sense to ensure each and every K9 team is as street-ready as they can be? Thanks for taking time to read another of my articles. If you’re interested in training or have questions about anything in the article please email me at [email protected], or visit our website.